^ CBC News. British Columbia Votes 2009: Coquitlam-Burke Mountain. CBC. ^ 5.0 5.1 簡蕙芝補選大勝返議會 獲63%選票 奪西基隆拿議席. 《星島日報》加西版. 2013-07-11 [2013-07-13]. 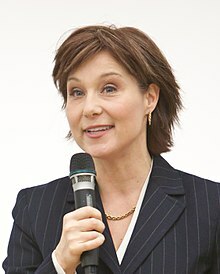 ^ Christy Clark to become B.C. premier, rules out snap election. 環球郵報. 2011-02-26 [2011-02-26]. ^ 9.0 9.1 9.2 9.3 9.4 Schreck, David D. Two Leaders, Two Bios. 2014-05-25 [2017-07-19]. ^ Fong, Petti. Christy Clark will be new B.C. premier. The Toronto Star. 2011-02-26. ^ 12.0 12.1 12.2 12.3 Richmond, Vanessa. Christy Clark and the Woman Politician Thing. The Tyee. 2010-12-09. ^ Radia, Andy. Liberals pull off surprise victory in B.C. election. Yahoo! News. 2013-05-15. ^ B.C. Liberal Leader Christy Clark. CBC News. 2013-04-03 [2017-07-20]. ^ Smyth, Michael. Clark eyes bid to replace Campbell. The Province. 2010-11-28 [2011-02-28]. （原始内容存档于2010-12-01）. ^ Ward, Doug. Christy Clark joins race for B.C. Liberal leadership. 溫哥華太陽報. 2010-12-08 [2011-02-28]. （原始内容存档于2011-02-17）. ^ Outgoing B.C. premier welcomes his successor, says Clark will do a great job. Canadian Press. 2011-02-28 [2011-02-28]. ^ Gordon Campbell steps down as MLA. CBC News. 2011-03-15 [2011-03-17]. ^ 金寶爾讓路助簡蕙芝參選 哈珀周二與新省長會面. 《星島日報》加西版. 2011-03-16 [2011-03-17]. ^ B.C. HST referendum set for June. CBC. 2011-03-25 [2011-05-13]. ^ 一度領先20點 NDP倒灶. 《星島日報》加西版. 2013-05-15 [2013-05-15]. ^ 新民主黨確定撿回一席. 《星島日報》加西版. 2013-06-06 [2013-06-06]. ^ 李群. 尹大衛785票氣走簡蕙芝 選情險惡 挑戰者全力搶攻. 《星島日報》加西版. 2013-05-15 [2013-05-15]. ^ Christy Clark leads B.C. Liberals to surprise majority. CBC News. 2013-05-14 [2013-05-15]. ^ 簡蕙芝將在西基隆拿補選. 《星島日報》加西版. 2013-06-06 [2013-06-06]. ^ 馮瑞熊. 6月初信任投票 決定簡蕙芝命運. 《星島日報》加西版. 2017-05-31 [2017-07-05]. ^ McElroy, Justin. NDP Leader John Horgan to be next premier of British Columbia. CBC News. 2017-06-29 [2017-06-30]. ^ Ghoussoub, Michelle. Christy Clark resigns as leader of B.C. Liberal Party. CBC News. 2017-07-28 [2017-08-10]. ^ 馮瑞熊. 辭自由黨魁議員職 簡蕙芝決退出政壇. 《星島日報》加西版. 2017-07-29 [2017-08-10].